A yorkie poodle hybrid, also known as a yorkie poo, is a cross between a yorkshire terrier and a toy or miniature poodle. Yorkies are feisty and active dogs with an above average intelligence. A yorkie poodle can be stubborn and harder to housetrain. They like to bark and have watchdog tendencies. They want to be the protectors of the family and think (and act) like they are much bigger dogs. They love being surrounded by their families and don't like being alone. Companionship is very important to them. 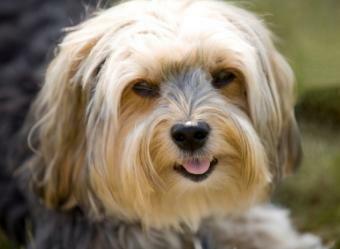 The yorkie's coat is hypoallergenic and good for those with allergies. If the yorkie poodle mix dog inherits the poodle's coat it will be non shedding and hypoallergenic. If it inherits primarily the yorkie's coat, it will not be. There won't be an undercoat. 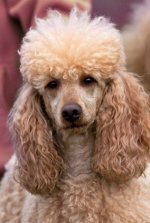 The coat is usually soft and silky and either straight, curly or wavy. This hybrid comes in apricot, black, gray, brown, cream, red, silver and white, usually with two colors mixed. The yorkipoo's poodle parent is usually a toy poodle. This designer dog will be 6 to 14 inches and weigh 4 to 14 pounds when fully grown. Average lifespan for these hybrid dogs is 10 to 15 years old. They should be walked every day and may be suited for agility events as they can run fairly fast and jump fairly high. Common health problems include epilepsy, skin diseases, eye problems, knee problems, hip dysplasia, hypothyroidism, liver shunts and Cushings disease. They are better suited for families with older kids and not younger children as this dog is tiny and can be hurt playing with a young child. 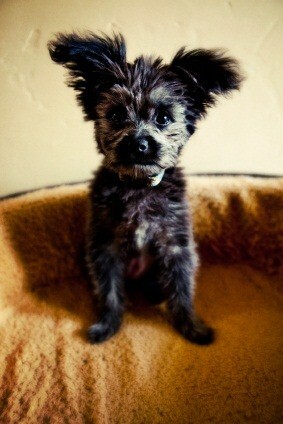 Enjoy your yorkiepoo as the years go by.